The American Gilbert W. Chapin (see biography of Gilbert W. Chapin) is a holder of three quite interesting patents for calculating machines—US patent №99533 and US patent №106999 from 1870, and US patent 646599 from 1900. He is a holder also of several other patents, e.g. for bird-cage screen (US186711), for coupon cutter (US454850), etc. 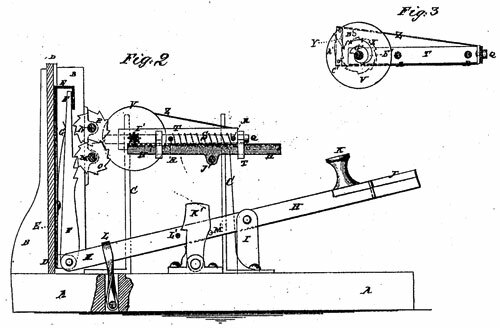 At this time, there were quite a few key-operated calculating machines, invented in Europe (see machines of Luigi Torchi and Jean-Baptiste Schwilgué), there are also a number of patents issued in the United States on machines of this class, let's mention only the devices of Parmelee from 1850, Hill from 1857, Nutz from 1858 and Winter from 1859. The device of Chapin has better construction compared to all of them, although not resolving a common problem for the early key-driven calculators—overthrowing the numeral wheels under a quick keystroke. Let's examine the first adding machine of Gilbert Chapin, using the patent drawings. 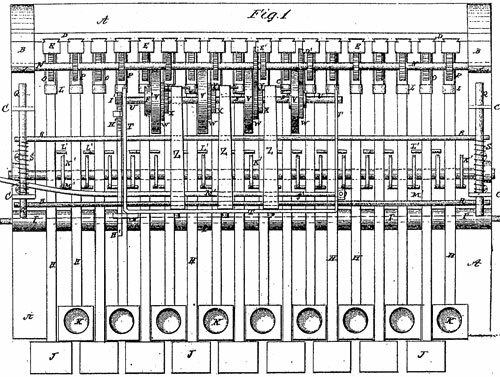 The machine was designed to add 2 columns of digits at a time, and with an attempt to provide means to shift the accumulator mechanism, or the numeral wheels and carry-transfer devices, so that columns of items having 4 places could be added by such a shift. In the Fig. 1 there are four wheels marked with V. These wheels, although showing no numerals, are, according to the specification, the numeral wheels of the machine. The wheels are provided with a one-step ratchet device for transferring the tens, consisting of the spring frame and pawl shown in Fig. 3, which is operated by a pin in the lower wheel. In Figure 1 the units and tens wheels are shown meshed with their driving gears. These gears are not numbered but are said to be fast to the shafts N and M, respectively (see Fig. 2). Fast on the shaft M, is a series of 9 ratchet-toothed gears (marked O), and a like series of gears P, are fast to the shaft N. Coacting with each of these ratchet-toothed gears is a ratchet-toothed rack F, pivoted at its lower end to a key lever H, and pressed forward into engagement with its ratchet gear by a spring G.
The key levers H, of which there are 2 sets, one set with the finger-pieces K and the other with the finger-piece J, are all pivoted on the block I, and held depressed at the rear by an elastic band L. The 2 sets of racks F, are each provided with a number of teeth arranged progressively from 1 to 9, the rack connected with the Nr. 1 key having 1 ratchet tooth, the Nr. 2 having 2 teeth, etc. 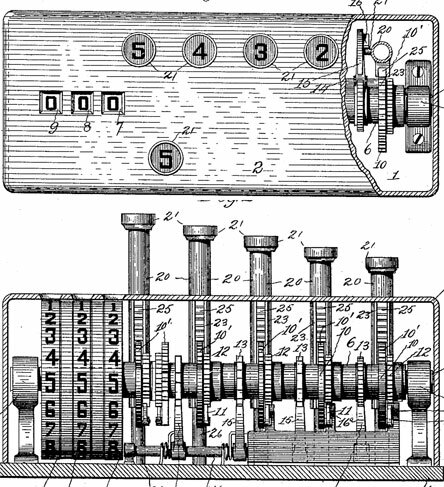 By this arrangement the inventor expected to add the units and tens of a column of numerical items, and then by shifting the numeral wheels and their transfer devices, which are mounted on a frame, designed for this purpose, he expected to add up the hundreds and thousands of the same column of items. It is hardly conceivable that Chapin should have overlooked the necessity of gauging the throw of the racks F, but such is the fact, as no provision of such means is provided in drawing, neither was mentioned in the specification. Even a single tooth if the rack F, could, under a quick keystroke, overthrow the numeral wheels, and the same is true of the carry transfer mechanism. 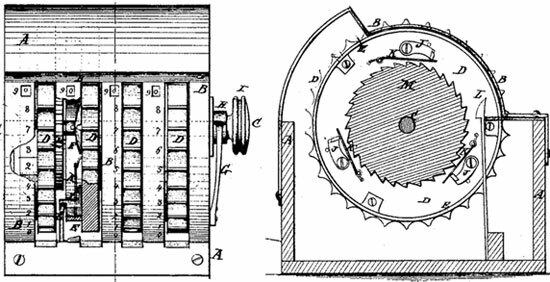 The machine of Chapin, just like the similar machines of Parmelee and Hill, was made without a thought as to what would happen when a key was depressed with a quick stroke, as there was no provision for control of the numeral wheels against overthrow. The second adding machine of Chapin (patented in September, 1870) is a much smaller and simpler device (see the patent drawing below). According to the specification, it has a simple, but reliable construction, missing the above mentioned problem of the early key-driven calculators—overthrowing the numeral wheels under a quick keystroke. It seems at least several devices of this type (see the upper photo) has been manufactured by Gilbert Chapin. Calculating machines of this type will become quite popular in the end of 19th/beginning of 20th centuries, see for example the machine of Fossa-Mancini. The third adding machine of Chapin, patented in April 1900, was again a key-operated adder, this time with a portable and reliable construction (see the patent drawing below). Unfortunately, despite its sound design, it remained unnoticed in the world of mechanical calculators.